If you’re looking to host without the work or you’re worried your guests are going to give you an excuse like “oh, the 14th? I’m feeding my cat that day”, get a caterer and you’ll be awarded the “throws a great party” title before your event even comes to a close! You don’t want just anyone, though (soggy sausage rolls and cold mini pies are a no-go) – so we’ve gathered a list of the best caterers you can find in Brisbane. William Wallace is someone you definitely want to bring home to mum, and can! 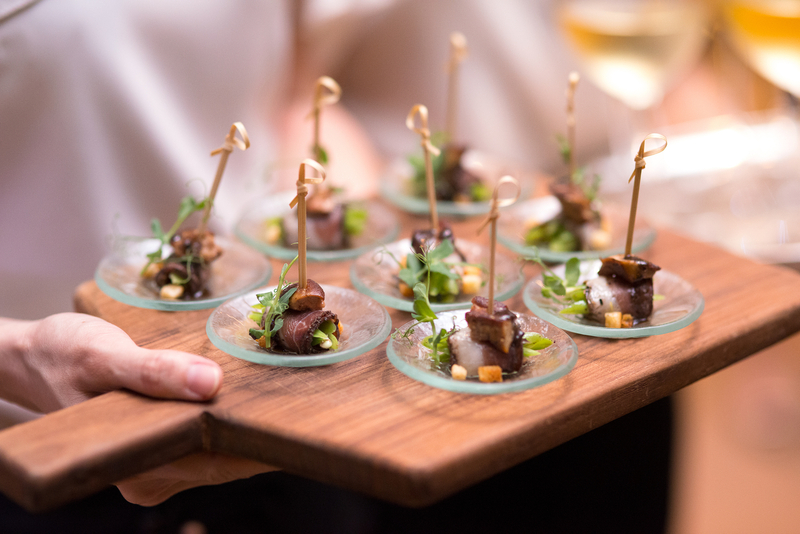 The Executive Chef of Events by William Wallace has years of international experience up his sleeve, (ahem, noma) and with a team of remarkable chefs, his catering company brings gourmet eats right to your dining table. Your next dinner party is set to feature gastronomic delights from spanner crab to scallops and exotic mushrooms, enjoyed in the comfort of your own home. Get inspired by the team, who even brign their own crockery, cutlery, and glassware, and see what your kitchen can do without having to step into it. Fresh is the name, catering is the game – and Al’FreshCo plays it well. Whether you’re after a cocktail party, something substantial or shared sit-down eats, they’ve got you covered. You’ll find no basic bites here, they’ve got everything from spanner crab rolls or seared smoked mozzarella to Thai red duck curry or sweet eats like chocolate and hazelnut tarts and Irish whiskey mousse with Baileys cream. Cuisine on Cue know how to make hosting a party a breeze – let them take care of everything. You want a buffet? Done. Flower arrangements? Sure. Can’t find a venue? No worries. From fancy canapés like twice baked goats cheese soufflé to chilled gourmet BBQs, these guys will know what you want before you do. Bonus: they’ll do almost any event you can think of. Thought parties had to be all about deep-fried finger food? Think again, because Wholesomeness will create a menu of delicious, organic and wholesome eats that will have your guests wanting more. Bonus, its all gluten and dairy free, and between the dukkah crusted lamb cutlets to the large salad platters, you won’t have to worry about keeping your gluten-intolerant guests happy (turns out they don’t consider lettuce to be a full meal). Whether your gathering doesn’t need oodles of eats or you’re catering for a special requirements crowd, Miss Bliss is the perfect go-to. With healthy and colourful meals, enjoy gluten free, dairy free, grain free, paleo, vegetarian or vegan and plant-based dishes that are hard on taste and low on guilt. They’ll tailor their menu to your needs, so ask and you shall receive! No job is too big or small for Dalton Hospitality, with everything from picnic baskets to private dinner parties to extravagant soirees in their repertoire. You don’t even have to waste time umming and ahhing over menu choices. Just tell them what you really want, whether it’s meaty banquet of ribs and roasts or an oyster shucking station with caviar and champagne, and they’ll make it happen. Want something a little bit outside the box when it comes to your party food. Caxton Catering’s cuisine is as easy on the eyes as it is on the taste buds, with creative flavours and exquisite presentation. Think signature sliders, exotic desserts and canapés like star anise roast duck and fried sake chicken. With 25+ years of experience, they know what they’re doing in the catering business. Don’t want fancy canapés, scalloped plates or even knives and forks? If you’re planning something a little more relaxed, and nobody minds cardboard instead of plates, there’s plenty of food trucks ready and willing to roll on up to the party. Char Baby, Oi! Taco and That BBQ Joint are just a few of the many trucks who’ll bring the food to you, with plenty more here, here and here. Don’t let your next party turn into a stress-tival.